Eat Clean Play Hard | Live healthy. Play smart. Parent well. Live healthy. Play smart. Parent well. Whew. Toddlerhood is starting to show it’s (sometimes ugly) face around our house. Miss K seems to be more toddler-like every day, which is causing me to remind myself of some of the behavior management techniques I haven’t used since I worked in preschool. The one I’m using the most these days is called a Sit & Watch. When I was in college at the University of Kansas we used this in my practicum. They would swear up and down that this is NOT a time out. But, that’s the fastest way to describe it to you is a mini-time out. I love them. They’re fast, they’re effective, and you don’t have to move from the downstairs playroom to the timeout chair that’s in your kitchen because someone is being naughty. Here’s how it works. When Miss K does something on our no-no list, and she has been redirected (Miss K, play with your toys instead of Bella’s bowls.) once already, I immediately sit her down right there on the spot, making sure she isn’t within reach of any fun stuff. She has to sit there for 1 minute (no matter her age). When she’s sat for a minute, I just pick her up and put her back on her way. The why behind this method? The most important part is that they’re not getting attention for undesired behaviors. It’s something they know they shouldn’t be doing, they’ve been told it’s not appropriate before, but they’re continuing to do it. So, this sends a message to stop without saying a word. Problem behaviors can become even more of an issue when a kiddo gets attention for a bad behavior, because sometimes even negative attention (a punishment, or getting yelled at) can be enough to reinforce a behavior. Be consistant. If you use a sit and watch once for hitting the dog, you need to use it EVERY time they hit the dog from then on. Try to redirect once, for non-violent behaviors. Kids have to learn what they are supposed to be doing. If we never tell them what’s okay, how are they supposed to know? Tell them a good alternative to what they’re doing. Violent behaviors don’t get a reminder. Hitting, biting, scratching, throwing things, or any other violent behaviors don’t deserve a redirection. It’s an immediate sit and watch. Be persistant. I cannot express how important it is to stick with this. If you don’t, you’re telling them you’re not going to follow through. If you try to get them to sit still in one spot for 30 seconds and then decide, “Miss K. is never going to sit here for a full minute, I give up!” you’ve just reinforced that a fit can get them out of the sit and watch. So, next time they’ll fight harder and longer to try to get you to give up. Be prepared when you first start to put up a fight. They’re not going to sit there and not fight what you’re doing the first few times (and later on when they feel like testing you to see if you’re still going to follow through). This explosion of behavior is called an extinction burst. They’re going to act out when you try to correct the behavior. But, I urge you, stick with it these first few difficult times. It’s always easier to put in the work on the front end, then to let this go on and on. The longer you wait to correct a behavior, the harder it is to correct. And, as I said before, if you give up half way through a fight, they’ll learn the more the fight the more likely you are to give up. If you need to, gently hold little one there until their time is up. However, do not let them up if they’re still fighting! Wait until they’re sitting calmly, even if at first you still have to have your hands on them for them to be sitting calmly in one place. They don’t need to be sitting calmly for a long time either, if they do it for a second, let them up. Then, progressively increase the amount of time they have to be sitting calmly before they can get up to one minute. Take it in baby steps and everyone’s life will be easier! It’s going to be frustrating! But, then when it works, it’s awesome! I’ll be honest, teaching “time out” of any sort is frustrating at first. Kids don’t like it! But, remember, it’s easier now than later! It still takes me several minutes to get Miss K to sit, stay away from what she was doing, and move on. But, she eventually does it and I know I’m setting us up for success later! Sit and watches are not for noncompliance. If you have asked your child to do something and they’re not doing it, don’t use a sit and watch. I’ll cover the technique for noncompliance soon (called three step prompting), but for now know that if you use a sit and watch for noncompliance your child can learn that if they do something violent or hurtful they can get out of having to do what you’ve asked them to do. For example, you ask your kiddo to put their dish in the sink. They don’t want to do it, so they bop sister in the head so they don’t have to put their dish in the sink. But, I’ll cover what to do in that case later. Correcting behaviors is never an easy task. If it was, all the children in the world would be walking around like perfect little angels. The biggest part of having a kiddo who listens and behaves isn’t about the kid: it’s about the parent and the effort the parent is willing to put in. What questions do you have about sit and watches? 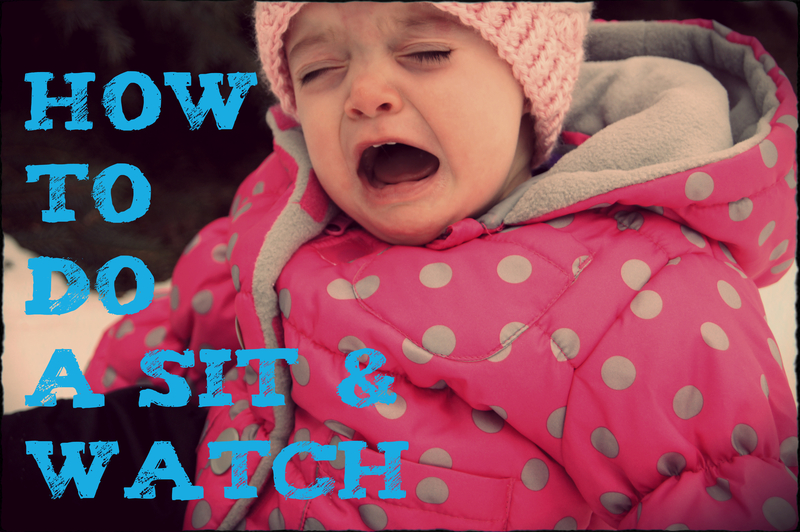 Do you feel like it could be an effective “time out” for your family? Today’s mini-project entailed testing out some cream scrub (similar to Soft Scrub), which ended up with me testing out several products you use to clean in and around your sink. This wasn’t necessarily the next cleaning product on my list I wanted to test out, but last night I burnt the heck out of my finger cooking dinner and skipped the dishes to sit with my finger in a bowl of cold water for the night. 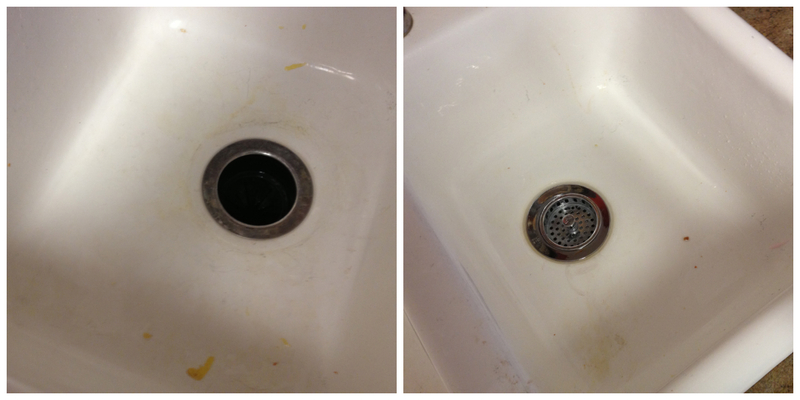 This resulted in one nasty sink today when I was able to do the dishes. Here’s the first product for today: Ecover Natural Cream Scrub. I also found it at Natural Grocers, but you can buy it here. Calcium Carbonate: Ready for it? It’s Tums. It is a naturally occurring ingredient. While it could be questionable in it’s use as a tummy helper, as an ingredient in my cleaners…I’m not too worried. If you really want to get scientific about what it is and where it comes from, check out this PDF. Bentonite: I find it slightly funny that this is also an ingredient that can be used for tummy troubles. This one has been used as a laxative. Apparently there are different forms of Bentonite, which is a type of clay, for more on the types and sources check out the every trusty Wikipedia 😉 . Once again, it’s naturally occurring and although I hav en’t researched it’s effects as a consumable product (although, Natural News lists it as a safe detox option), as far as cleaning goes, I think we’re in the clear. Phenoxyethanol: This one scared me. It was long and I couldn’t pronounce it, which is the number one rule against leaving a food on the shelf. But, this one is used in cosmetic skin creams and sunscreen, as well as a long list of other bodily uses. It’s an organic compound according to Wikipedia which is used for a preservative. This one I’m pretty sure I wouldn’t put in my body. I’ll let it stick around on my cleaning list for now. Coco-glucoside: This one is caused by a chemical reaction between Glucose & coconut oil derived ingredients according to EWG’s Skin Deep Cosmetic’s Database. This is also used in cosmetics and skin care products. Sounds a little nastier than the other ingredients, however, in the cosmetic world it’s apparently know for it’s mildness. A far cry from bleach which is found in many Soft Scrubs. Xanthan Gum: This is found in natural food stores and you eat it. I guess I recognized this one as well, but I wasn’t really sure what it actually was. It caused by the fermentation of a few easily recognized substances: glucose, sucrose, or lactose. Doesn’t it go without saying at this point? Not sure I’d eat it, but for cleaning…let’s test it out! Okay. Whew. Now that we got the ingredients out of the way, let’s test it out. This is the way my sink looked before I started cleaning. We had Cauliflower crust pizza last night, so cheese and tomato sauce were causing me some problems. It was definitely cleaner, but there was still some discoloration. This didn’t pass the test for me of a sink that has been officially shone. (Thank the Fly Lady for this habit. She’s slowly teaching me the skills I need to keep this house free of chaos! Check her out, she’s great!) I got really excited and wanted to try a homemade bleach recipe. However, you need hydrogen peroxide for all of the homemade bleach recipes and we apparently don’t have any. So, I decided to try a mix of the Ecover Cream Scrub, Ecover’s Dishwashing Liquid (I promise I’ll tell you all about this one soon! ), and some good old Baking Soda. As you can see, it’s better, but there is still some discoloration. It was clean though. Just discolored. I doubt if you have a stainless steal or darker colored sink you’d have this problem. Our white sink was just causing problems here. Overall, I think the Ecover’s Natural Cream Scrub did almost as good of a job as the Soft Scrub I have used in the past. However, the Soft Scrub had the advantage of having bleach as an ingredient. So, if you take away the bleach, I think it probably did a better job. One of the most noticeable differences: I didn’t have a headache when I was done using this product like I usually do when I’m using Soft Scrub. Incase you were wondering, I am still singing Glycerine. 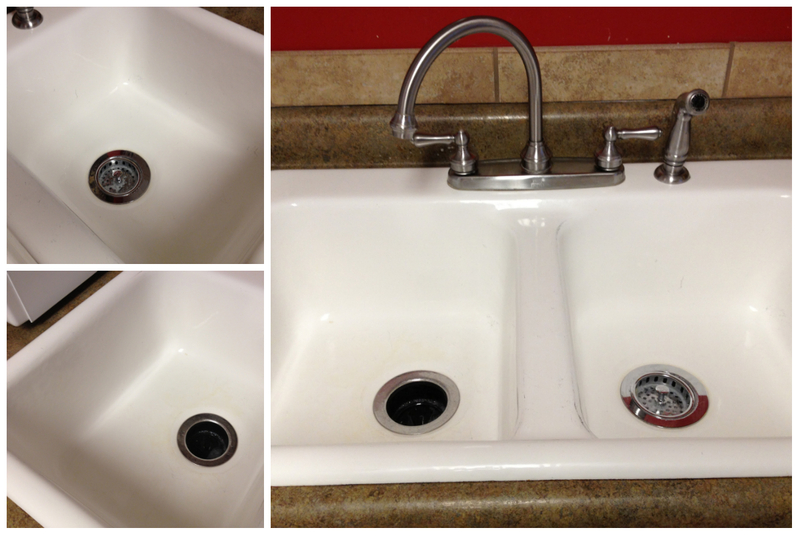 Now, go shine your sink (as the Fly Lady would say)! P.S. I also gave my stainless steel faucet a shine while I was waiting for the cleaning supplies to soak with some good old baby oil. I trick I learned from Pinterest a while back: put some baby oil on a rag, rub down the stainless steel and shine it up! So, obviously life got in the way of my little project I started before the holidays. I got a bit busy with holiday preparation, went out of town for Christmas, and then had a family with a nasty stomach bug that’s going around. But, I’m back and read to take on my project! Pretty simple ingredients, huh? The one that got me was Emulsifier. Turns out that’s just a wetting agent that can come from a variety of sources, many of them plants. So, I feel pretty good about what’s IN this cleaner. How did it stack up on the job? Turns out it works great! We had a coffee spill in the living room a few weeks back when my husband left his coffee on the entertainment center and we left the house. The dog had a little coffee break when we were gone and left us one heck of a mess when we returned. Coffee was all over the entertainment center, cable box, and stereo from the splash of the cup hitting the floor. That day I cleaned with my normal furniture polish and thought it had done a good job. Well, today when I was scrutinizing the job the Earth Friendly stuff was doing I noticed spots the old polish had left behind. With a little extra squirt over the spots, they were gone in a single wipe! My furniture is shiny enough to see reflections and I’m a happy camper! I also feel like it went further than the old junk. Once I had a few squirts down on the entertainment center I didn’t need to spray any additional cleaner unless there was a stubborn spot, what was on the rag was good enough to do the job. The stuff smelled good too, orange and fresh, nothing chemical or nasty about it. 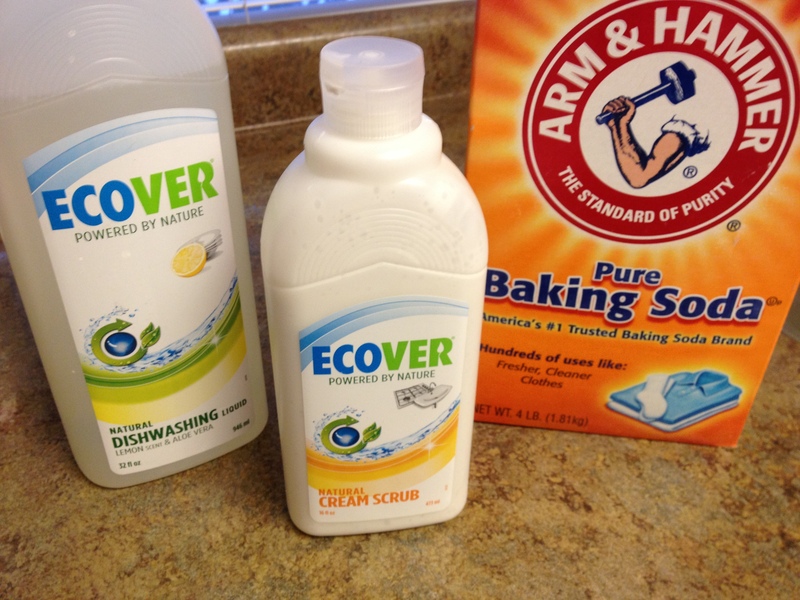 So, mark that one off the list of things you have to make yourself, this 100% natural cleaner is a winner in my book! My goal today was to make a list of the cleaning supply products I would need for the kitchen and diningroom and find recipes or replacements for all of them. I pulled out my cleaning tub and wrote down all of the products I had: A general kitchen cleaner, Lysol, bleach, baby oil, stainless steal cleaner and a furniture polish. Armed with my list of cleaners I needed to create, I headed over to Pinterest and started searching for recipes or alternative cleaners I could buy (because, why add more to our to-do list if you can buy something that’s just as good off the shelf. I also like to support companies who create good-for-you products that I can recommend to everyone and hopefully get a few more people on board!). The good news: It’s pretty easy to find an alternative. The bad news: there are so many choices, how on earth do you choose what you want to create? I decided I’d start with what I could purchase off the shelf. So, I found a list of chemicals I should be sure to avoid in cleaning products here. So, tomorrow I’m off to my local Natural Grocers to see what I can find. I’m also going to check out the Meyer’s line that Target carries. So, there is your sneak peak at Day 2…What Can I Find Pre-made? This morning as I was getting ready for the day I found myself laughing at how insane I must sound to someone who happened to be walking by my house and could hear me. I was describing everything I was doing, everything I was thinking, and seemingly talking to myself like a crazy person…if they didn’t know I was talking to Kennedy. As she sat there watching me in amazement as I tamed my crazy head of curly hair I could see the wheels turing and knew how important my babbling was. A lot of parents do this as second nature: they describe anything and everything they do/see as they go about their day. They’re constantly talking to their child, no matter how young. This really is a great way for kids to learn. Not only does it increase their language skills and understanding of the world, it literally teaches them how to think. When you describe exactly what you’re thinking, particularly when problem solving, this is a teaching strategy called a Think Aloud. Teachers in a classroom use it a lot when solving a problem. For example, if I were to teach my students how to add 2+2 I might say something like this: “Okay, I see the math problem 2+2. I know that means I’m going to put two groups of two together. So, if I had two apples and two more apples that would be 1,2,3,4 apples. So, the answer to 2+2 is 4.” I say everything I’m thinking out loud so the student can learn how to think through the problem themselves. Are they going to always do it exactly the same way? No, and they shouldn’t. But, the student needs to be taught HOW to THINK, aside form simply doing the math problem. So, how does this fit in to my morning routine? As I talk through my day, I’m doing the same thing for Kennedy. For instance, this is what I was saying to her this morning as I did my hair. “It’s time to do my hair before it gets too dry. Where is my comb? I’m going to look for it in the drawer. Not in there. I wonder if it’s in my hair basket? Oh, there it is! See, here’s my comb. I’m going to carefully comb my hair, it seems tangled today. There, that’s better. I’ve got to get my curl cream out of the medicine cabinet. 1, 2, 3 squirts. Rub, rub, rub it between my hands. Upside down I go. Scrunch, scrunch, scrunch.” And so on. Take a close look at what I actually was doing there. I was putting names to concepts (combing, rubbing, tangled, etc. ), as well as teaching problem solving skills (while I explained that I was looking for my comb). I try to do this all the time: when I’m getting ready, cleaning, shopping (yes, you get strange looks! ), playing with her, driving, everything! Be real though, do I think out loud every moment of every day? No. Sometimes silence is golden as well. Start by at least trying to do this with new experiences for your little one. The holidays are a great time to start this: think of all the new experiences they’re going to have if this is their first holiday season! The lesson for parents? Just think out loud when you’re with your little one, in everything you do! While it might feel a little strange at first, honestly, it’s teaching a lot of valuable skills to your little one! 1. Wash and scrub potatoes well, since you’ll be leaving the skin on. A vegetable scrubber makes this much easier! 2. Leave the skin on the potatoes and dice them into 1 inch thick chunks. 3. Bring water to a boil in a large sauce pan. 4. Add diced sweet potatoes and boil for 10-15 minutes or until potatoes are soft. 5. Drain the water from the potatoes and return to sauce pan. Add milk, cinnamon, butter, and salt and pepper and mash with a fork or potato masher until desired consistency. They don’t have to be silky smooth, I actually prefer mine a bit chunky! Enjoy! I had no idea how to cook fish before we started eating clean. Now, I love it as an easy stand by. It’s quick and delicious and can be paired with easy sides like steamed or sautéed veggies and cinnamon mashed sweet potatoes! 2. Place salmon fillets in pan, skin side down. Sprinkle with lemon pepper seasoning and squeeze the juice of 1/2 the lemon on each salmon fillet. 3. Cook until salmon is firm and flaky, turning often. About 15 minutes.